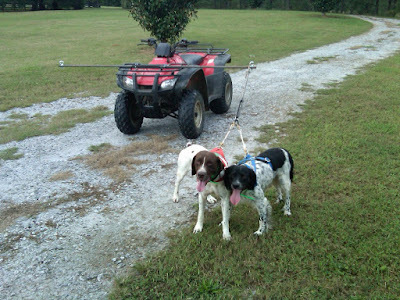 These two tired bird dogs are just getting back from a short "roading" jaunt. What a great way to get some dogs into shape. It amazes me that they love it! They pull as hard as they can as long as they can. It's a simple set up using roading harnesses. Eventually, I'll get up to 4 dogs per run. Right now, I'm waiting for the pasture to get cut- I don't want to get all four dogs on the road at once. Once the hay is cut, we'll be able to make loops of the fields as much as we want.